VideoSecu corner TV mounts for flat screen supplies a variety of well designed, top-notch quality and easily-installed mounts at affordable prices. 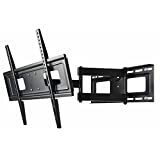 The Articulating TV Wall Mount MW365BBM7 is constructed of heavy-duty steel and supports most 32-65 inch screens with holes spaced up to 16 inches high and 24 inches wide. The VideoSecu corner TV mounts give you a number of viewing angles as it tilts forward 15 degrees and backward 5 degrees. It has a single arm design that supports a 180-degree swivel, the plate turning 90 degrees left and right (the maximum degree actually depends on your screen size). The security screws on the Articulating TV Wall Mount MW365BBM7 lock the wall mount to the TV bracket from the bottom, reducing any risk whatsoever. 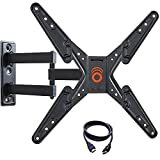 Before you buy these corner TV mounts for flat screens, you should ensure that your TV weighs less than 135lbs/61kg as that is the maximum weight it can support. You should also measure the distance between the mounting holes at the back of the TV. If they measure 24 by 16 inches, then it will work perfectly for you. Additionally, your TV should be at least 32 inches in size to perfectly conceal the mount. On the downside, this unit may not work for some 55 to 65 inch TVs that were manufactured a long time ago. Designed to universally fit most LCD, LED and Plasma TVs and most other flat screen TVs, the Mount Factory Pro-x6 wall mount is one of the best corner TV mounts available. It perfectly fits displays from 40 to 70 inches, as it is designed to common VESA patterns featured in almost every flat screen TV. This is a very sturdy unit. Pro-x6 corner mount TV is made of heavy-duty steel and fitted with top-quality barrel hinges that allow it to support up to 100 pounds of flat screen TV. Despite the weight that it holds, it has a smooth-motion design that allows it to pan, tilt, and extend to give you the perfect viewing angle. Its arms extend 3 to 20 inches from the wall and allow you to rotate your TV 160 degrees left or right. For added convenience, these arms and its backplate are preassembled on opening the box, and the manual will guide you through the simple installation. The only shortcoming to this otherwise good product is in its manual. Although the details to install it are in the manual, they are not as clear as they should be especially for a first-timer. Setting it up may prove to be quite the task, and may require additional help either from a professional, or online manuals. The Mount-It! 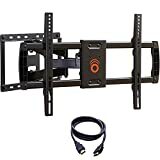 Full Motion Articulating TV Wall Mount Bracket will offer you maximum versatility on a purchase. 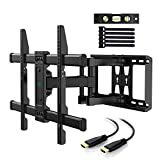 It has a minimum extension of 2.2 inches and a maximum of 23.7 inches, and is suitable for Plasma and LED TVs with displays ranging from 32 to 65 inches. It also has a very sturdy swivel arm design that allows it to support up to 100 pounds. This TV wall corner mount bracket is perfect for TVs with mounting holes 16 inches by 24.5 inches apart, vertically and horizontally respectively. It provides you with a number of viewing angles with its 90-degree swivel. Even though the swivel angle is not as wide as that of other models, at its price point, 90 degrees is quite sufficient. You can tilt your screen 2 degrees up or up to 12 degrees down, dependent on your screen size. Its steel construction is powder coated, giving it a high-tech, sleek look. Additionally, as an added convenience, an integrated bubble level is included. This is the perfect unit for corner installations. You can rest assured with this wall mount bracket as your TV is in safe hands. The PERLESMITH TV Wall Mount Bracket is designed according to UL standards and can hold up to 120lbs of 37 to 70-inch displays. UL standards require that the products are tested to hold four times their weight rating. The corner tv mount by PERLESMITH is perfect for flat-screen TVs with mounting hole patterns less than 16 inches vertically and 24 inches horizontally. It is made of heavy-duty steel for stability and security and coated with a black powder finish to give it a fine-looking finish. The PERLESMITH TV Wall Mount Bracket allows you to place your TV in perfect viewing angles with its adjustable tilt, rotation, swivel, and extension. Additionally, its articulating arm design allows the display to be folded along the wall, saving space. On the downside, this unit cannot be used on drywall alone or concrete wall. You will need to check for wood studs on your wall before you install the unit. The lightweight VideoSecu TV Wall Mount ML10B is made for small-medium sized displays. It is rated up to 33lbs and can accommodate 14 to 24-inch screens – and possibly larger. The corner tv mount is made of an aluminum alloy and makes use of the single arm design. This design has a wrist and elbow design, and extends by about 1.6 to 14 inches, with a full 180 swivel capability. Installation is quite simple, and will only require two screws against one stud. You should, however, pay attention, when putting the base plate into position, to the arm alignment to prevent the TV from leaning either up or down. Unfortunately for the VideoSecu TV Wall Mount ML10B, there is not level adjustment and this serves as its drawback. Although you can compensate by making sure the arm joints are really tight, it may make movements cumbersome and stiff. All in all, it is a good product if you want a low cost, preassembled, simple wall mount. 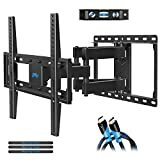 This unique corner TV wall mount comes with the dual arms design. The Mounting Dream MD2380 TV Wall Mount Bracket is very sturdy, holding up to 99 pounds of 26 to 55-inch displays. Its mounting holes are up to VESA standard so there should be minimal if any problem with most of the TV brands currently in the market. This would make this mount to be one among the best corner tv wall mounts on the current market. You have to be certain that you won’t change your mounting spot. This is so because the Mounting Dream MD2380 TV Wall Mount Bracket, although it is tilting and swiveling wall mount, its base is low profile. This means that it is stationary, allowing you to only adjust it left, right, up and down. Installing the Mounting Dream MD2380 TV Wall Mount Bracket will give you a lot of viewing perspectives. It does this through its great swivel and tilt capabilities. You can tilt your screen 5 degrees up or 15 degrees down depending on your screen size, and swivel it 45 degrees into either direction. The frame on the unit is made of heavy-duty steel, with a powder coat to give it an elegant look. It is generally a very good product. However, it is stiff when extending and retracting. This is not necessarily a drawback as it is part of the whole “sturdy” package. If you have a medium sized screen (26 to 55 inches) then the ECHOGEAR Full Motion TV Wall Mount will open up a world of new possibilities. With an extension of up to 20 inches and a complete 180-degree swivel, this convenient mount is not just for corner mounted TVs. Whichever spot you pick to install it, it will work just as well. Installing it is a simple task that can be easily accomplished by one person while following the clear manual. This is so because it installs a single wood stud for added flexibility. The ECHOGEAR Full Motion TV Wall Mount is built up to VESA standards, making it compatible with most TV models. Additionally, it is thoroughly tested and UL certified to hold up to 60 pounds, so your display will be safe on its strong arm for a long time to come. ECHOGEAR corner TV mount for flat screens is very confident in its product, and offer a 5-year warranty, so you are assured of its sturdiness and durability. Why not try such best corner tv mounts! The MD2377 TV Wall Mount Bracket from Mountain Dream is designed to snugly fit 26 to 55-inch displays. It is super stable and features an articulating arm that greatly boosts its functionality. It has a very simple, but an aesthetic design that doesn’t require any prior knowledge or skill to install. The package comes with an anti-static cleaning gel, HDMI cables, magnetic bubble level, and three Velcro cable ties, and a manual ensuring you have everything you need to make installation a painless process. The MD2377 TV Wall Mount Bracket has a capacity of 66 pounds, which is more than enough for medium-sized screens. With this, achieving the ideal viewing angle is very easy, simplified by its ability to swivel 90 degrees in either direction. It also allows you a 5-degree tilt upwards and a 15 degree tilt downwards, making it an extremely versatile unit. You can even do a post-installation adjustment to make sure that your display is at the perfect level. This wall mount makes use of the automatic robot welding technology, making it very stable and sturdy. Additionally, its articulating arm extends up to 15 inches and can retract to save on space. Built from 100% high-grade steel, the EGLF1-BK Full Motion TV Wall Mount Bracket by ECHOGEAR is perfect for large TVs. It supports most VESA patterns and is tested and UL certified to hold up to 132 pounds of 37 to 70-inch displays, higher than all the wall mounts on this guide. You can now rest your large TV on the arm of this cheap corner tv mount and relax for a lifetime. Mounting the unit is very easy, taking no more than thirty minutes. If you are bugged by lights or glare, I have some good news for you. 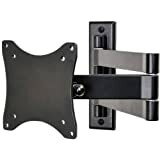 The ECHOGEAR EGLF1-BK Full Motion TV Wall Mount Bracket can extend 2.6 to 16 inches from the wall. Additionally, you can tilt it up to 15 degrees downwards, and features a smooth swiveling capability, going 75 degrees into either direction. The best corner wall mount for flat screen TV by ECHOGEAR has an amazing construction and design, to say the least. The package includes loop ties to manage cables and three hooks. It also has its signature orange color that adds some vibrant color to the room. 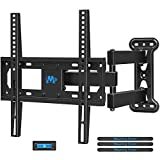 Popular in most 2019 top 10 corner TV wall mounts reviews, the ALAMLB TV Wall Mount Bracket by Cheetah mounts is a professional-grade wall mount that supports 22 to 55-inch displays. It has a sturdy and stable design that functions well with LED, Plasma, and LCD flat screens. This corner TV mounts for flat screen allows you to extend it up to 20 inches, and retract it to 3.25 inches to save on space. On top of that, it has a 180-degree swivel, a 15-degree up/downward tilt, and a four-degree rotation adjustment, all of which add to its convenience and versatility. What sets this apart from the others on this list and puts it on the number one position is that the unit is also ceiling mountable. Although the package comes with ceiling conversion hardware, this is a procedure that is best done with the aid of a professional. What I really loved about the ALAMLB TV Wall Mount Bracket is its unique ballhead motion. The motion, at the tip of the arm, allows for a full 360-degree rotation. This is among the few TV wall mounts that allow change from landscape to portrait. Apart from the mount, the package includes a manual, installation kit, a magnetic bubble level, and an HDMI cable. 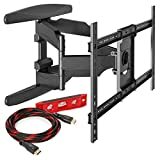 There is no dispute to say that Cheetah corner mount for flat screen TV is the best corner mount TV 2019. The models on this list not only mitigate the effects of the glare, but also allow you to save on space, and keep your TV safely secured to the wall for maximum functionality every time.